And Stephen Keshi is named, the new Super Eagle's coach. Mandated to qualify for AFCON 2013 and reach the QF of the WC 2014. Nigeria have appointed former captain Stephen Keshi as the coach to revive the fortunes of the Super Eagles. Keshi replaces Samson Siasia, who was sacked last Friday after his 2012 Nations Cup qualifying failure. The 49-year-old, who captained Nigeria at the 1994 World Cup finals, was previously in charge of Mali and Togo at international level. Keshi was also part of the last Nigerian side to win the Africa Cup of Nations - as they did in 1994. "It was a unanimous decision taken by the Nigerian Football Federation (NFF) for the appointment of Stephen Keshi as the new head coach of the national team," said NFF deputy president Mike Umeh. The NFF's Executive Committee met in the Nigerian capital Abuja on Wednesday and deliberated on the recommendations of the body's Technical Committee, who had recommended Keshi. Having been given a deal that goes until 2014, Keshi has been handed the mandate of taking Nigeria to both the 2013 Nations Cup and the World Cup the following year. His contract includes a stipulation that he must qualify for South Africa 2013 and reach the quarter-finals of the 2014 World Cup in Brazil. Keshi will be free to choose his assistant. 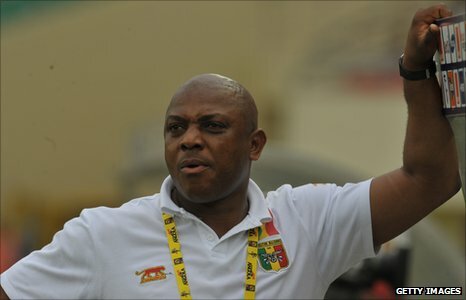 There was no news on whether a Technical Director will be appointed to oversee Keshi's role. The BBC's Aliyu Tanko in Abuja says Keshi's appointment is a popular one in Nigeria. This is mainly because Keshi achieved a major qualifying success when leading unfancied Togo to the 2006 World Cup in Germany. Congr. Big Boss hope u make us proud. if keshi fail, they will still sack him!!!!! will this be ok 4 naija? Nice one, and i hope he does not end up hastling the supposedly senior players like our brother Siasia. Lets see hw ds 1 goes. . . This guys at the glass house re serious jokers,we dey luk sha! This is good, but he still has the same challenges that Sia1 had. Hope he will be able to deal with it. Wish him all the best. From fried to charcoal roasted fish! how much are they paying him? E be like say you like ball well well. Na so e suppose be. Anyways, he would have definitely read the contract., and so he knows the baseline performance benchmarks. If he fails to qualify for the Nations cup and World Cup then it would be foolish of him to cry foul when he is sacked. But sha he's luckier than Sia1 'cos he has more than enough 'idle' time to build the team and earn awoof salary. Let's see how far his luck can push him. I wish him luck and if given the same free access given to Siasia, he's going to do PRETTY well. From frying Pan to WILD BUSH FIRE. We just put SE into the hands of a confirmed failure (coaching wise). From Mali to Togo, na so so fail fail and now its our turn. God forbid, for this kain country sef! Lets hope something good comes out this time. Youngest Player On The Afcon(photo) / Johny Akinyemi: Nigeria's First Canoeist In The Olympics / Mixed Fortunes For Nigeria As Abugan Makes 400m Commonwealth Games Final!